Despite being the subject of considerable scientific study, Volcanoes continue to remain both dramatic and unpredictable. In 1991 Mount Pinatubo, 100 km north of the Philippines capital Manila, suddenly burst into life after lying dormant for more than six centuries. Most of the world’s active volcanoes occur in a belt around the Pacific Ocean, on the edge of the Pacific plate called the Ring of Fire. Indonesia has the greatest concentration with 90 volcanoes, 12 of which are active. The most famous, Krakatoa erupted in 1883 with such force that the resulting tidal wave killed 36,000 people and tremors were felt as far away as Australia. The term volcano originates from the little island of Vulcano in the Mediterranean sea off Sicily. Centuries ago, the people living in the area believed that Vulcano was the chimney of the forge of Vulcan – the blacksmiths of Roman gods. It was believed that the hot wave fragments and clouds of dust erupting from the Vulcano came from Vulcan’s forge as he beat out thunderbolts for Jupiter, king of gods, and weapons for Mars the god of war. In Polynesia the people attributed eruptive activity to the beautiful but wrathful Pele, Goddess of volcanoes whenever she was angry or spiteful. Today we know that volcanic eruptions are not super-natural but can be studied and interpreted by scientists. Volcanoes are mountains but they’re very different from other mountains. They’re not formed by folding and crumpling or by uplift and erosion. Instead, volcanoes are built by the accumulation of their own eruptive products — lava, ashflows and tephra (airborne dust and ash). A volcano is most commonly a conical hill or mountain built around a vent that connects with reservoirs of molten rock below the surface of the earth. The term volcano also refers to the opening or vent through which molten rock associated with gases are expelled. The molten rock, which is lighter than the surrounding solid rock, forces its way upward due to buoyancy and gas pressure and may ultimately break through zones of weaknesses in the earth’s crust. If so, an eruption begins, and the molten rock may pour from the vent as non-explosive lava-flows, or it may shoot violently into the air as dense clouds of lava fragments. Larger fragments fall back around the vent and accumulations of fallback fragments may move down slope as ash-flows under the force of gravity. Some of the finer matter ejected may be carried by the wind only to fall to the ground many miles away. 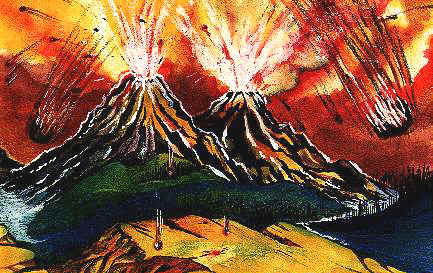 But why do volcanoes erupt? Geologists say that deep within the earth it is so hot that some rocks slowly melt and become a thick flowing substance called magma. Because it is lighter than the solid rock around it, magma rises and collects in magma chambers. Eventually some of the magma pushes the vents and fissures in the earth’s surface. A volcanic eruption occurs. Magma that has erupted is called lava. The eruptions also differ from one another. Some are explosive and others are not. How explosive an eruption is depends on how runny or sticky the magma is. If the magma is thin and runny, gases can escape easily from it. Thus when this type of magma erupts, it flows out of the volcano. The lava-flows rarely kill people because they move slowly enough for people to get out of their path. However, they may cause considerable devastation to buildings in their path. If the magma is thick and sticky, gases cannot escape easily. Pressure builds up until gases escape violently and explode. In this type of eruption, the magma blasts into the air and breaks apart into pieces called tephra. Tephra can range in size from tiny particles of ash to huge boulders. Explosive volcanic eruptions can be dangerous and deadly. They can blast out clouds of hot tephra from the side or top of the volcano. These fiery clouds race down the mountain side destroying almost everything in their path. Ash erupted into the sky falls back to earth like powdery snow. These blankets of ash can suffocate plants, animals and humans. At times mudflows are formed when hot volcanic materials mixes with water from streams or melted snow and ice. Mudflows have buried entire communities located near erupting volcanoes. The least violent type of eruption is termed Hawaiian and is characterised by extensive fluid lava flows from central vents or fissures. Strombolian eruptions are characterised by moderately fluid lava flows, usually accompanied by violent lava-fountains that produces an abundance of volcanic bombs and cinders. Vulcanian eruptions are characterised by viscous magmas that form short, thick flows around vents and solid fragments of lava are violently ejected from these vents. The most violent eruptions, such as that of Washington’s Mount St. Helens in 1980, are termed Plinian after Pliny the Elder, who died in the Vesuvius eruption of 79. They include the violent ejection of large volumes of volcanic ash, followed by collapse of the central part of the volcano. Because there may be hundreds or thousands of years between volcanic eruptions, people are usually lulled into a false sense of complacency about volcano’s dangers. When Mt St Helens erupted in 1980, it had not erupted for 123 years. Most people thought Mt St Helens was a beautiful, peaceful mountain and not dangerous volcano. Most volcanoes provide various types of warnings before eruptions begin. Although an explosive volcano could occur without warning, some premonitory events more likely will precede the next eruption. Steam-blast eruptions could occur with little or no warning as superheated water flashes to stream, magmatic eruptions will generate earthquakes, the ground surface may appear deformed and there may be a change in temperature of the ground or spring water. Precursors to volcanic activity may continue for weeks, months or even years before eruption activity begins. Most of the world’s volcanoes are found along the margins of huge plates into which the Earth’s crust is divided. The largest volume of volcanic material emerges at sea-floor spreading centres between plates, such as the Mid-Atlantic Ridge. These mid-ocean ridges are usually basaltic in composition and erupt quietly onto the ocean floor. In contrast, the volcanoes formed over subduction zones may be among the most violent. Along continental margins chains of volcanoes such as the Andes have formed. Collisions of oceanic crust produce island arcs such as the Greater and Lesser Antilles, the Aleutian Islands and Japan. In addition to these plate margin areas, volcanoes also form over “hot spots” within a plate, as in the cases of the Hawaiian Islands and the Yellowstone volcanic field. About 500 active volcanoes are known on earth, not counting those that lie beneath the sea. Volcanoes are not randomly distributed over the earth’s surface. Most are concentrated on the edges of continents, along island chains or beneath the sea forming long mountain ranges. More than half of the world’s active volcanoes above sea-level encircle the Pacific. The largest eruption in the world occurred in 1912 at Novarupta on the Alaska peninsula. Mauno Loa (Hawaii) is the world’s largest active volcano, projecting 13, 677 feet above sea-level, it’s top being over 28,000ft above deep ocean floor.